Violence against women and girls is one of the most widespread violation of human rights worldwide. In Asia and the Pacific, violence affects around one in three women in her lifetime. Violence against women impedes human development, and has serious negative consequences, ranging from immediate to long-term physical, sexual, psychological and social impacts, which often prevent women and girls from fully participating in society. In addition, it carries tremendous economic costs. These costs are borne at all levels, from the individual and the household to the wider community and society at large. 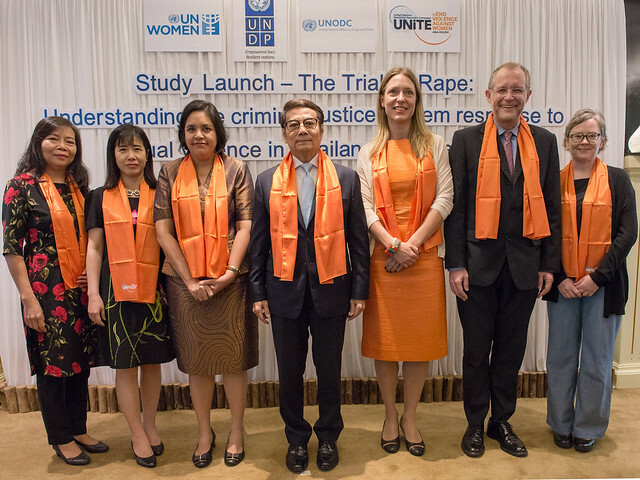 As a part of the 16 Days of Activism Against Gender-Based Violence Campaign (25 November - 10 December), UN Women, UNDP, UNODC will release a study identifying the key factors that hinder women from achieving justice in Thailand and Viet Nam. The study is the first of its kind in the Asia-Pacific region which provides important new insights into where and why attrition occurs in the administration of justice for women survivors of sexual violence and how it can be reduced. It also provides constructive recommendations to address the challenges in criminal justice sector. วันพุธที่ 29 พฤศจิกายน พ.ศ. 2560 เวลา 10.00 - 11.50 น.